Andrea Pozzo (1642–1709), Allegory of the Jesuits' Missionary Work (detail) (1691-94), fresco, dimensions not known, Sant'Ignazio, Rome. Wikimedia Commons. Humans have used paintings for many purposes. One which emerged quite early on is to create an artificial reality: by painting the interior of buildings and shelters, to extend them into gardens or the world outside. In the absence of any surviving wall-paintings of the ancient Greeks, in European art the earliest evidence of this comes from the Romans. 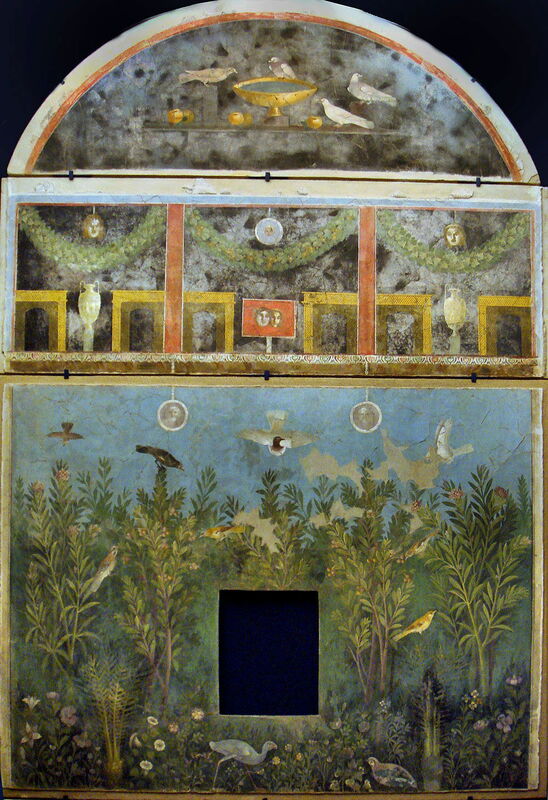 Several of the villas and other buildings found among the buried ruins of Pompeii have lavish wall-paintings which visually extend their rooms into a more spacious outdoors. This wall from the House of the Golden Bracelet retains its air of reality nearly two millenia after its creation. To modern eyes, Roman wall-paintings which tried to extend interiors into urban settings now look strange, because of their use of multiple perspective projections. Presumably this was not a problem to those who viewed them in classical times, an issue which I will return to in a later article. The advent of accurate three-dimensional perspective projection in the early fifteenth century enabled painters to create visually-arresting imitations of reality, and wall- and ceiling-paintings flourished. In doing so, they sought to do away with the duality of painting, although that remained in easel paintings. The successful mural wanted to pretend that it didn’t exist as a 2D painting, only as its 3D deception. 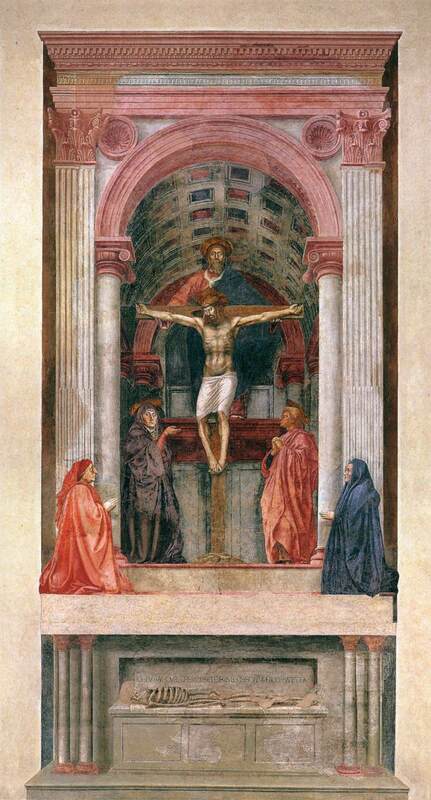 One of the first paintings to employ modern perspective projection, Masaccio’s magnificent The Holy Trinity (1426-8) in the Basilica of Santa Maria Novella in Florence, is a brilliant demonstration of how effective and deceptive such works can be. Probably developed in collaboration with Filippo Brunelleschi, the architect who first discovered the geometry of such projections, when viewed from the right position it convinces the viewer’s brain of true depth. Artists flocked to Florence to experience this, then went away and worked the same geometric magic elsewhere. Over the next centuries, many were to be employed painting expanses of walls and ceilings from rickety scaffolding in pursuit of even greater deceptions. With only modest investment, smaller family chapels suddenly expanded to embrace glimpses of heaven, or hell. Many frescoes couple powerful projection with enormous size to extend the building that they are in, and this is almost universal with painted ceilings. 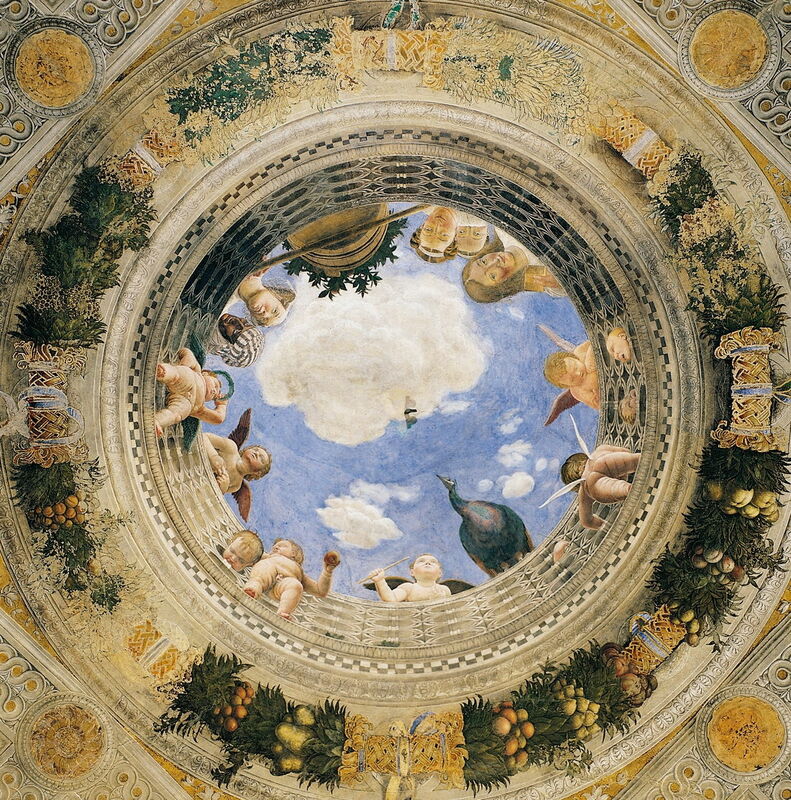 Andrea Mantegna’s oculus on the ceiling of the Spouse’s Chamber in the Palazzo Ducale, Mantua, is a splendid example from 1473. 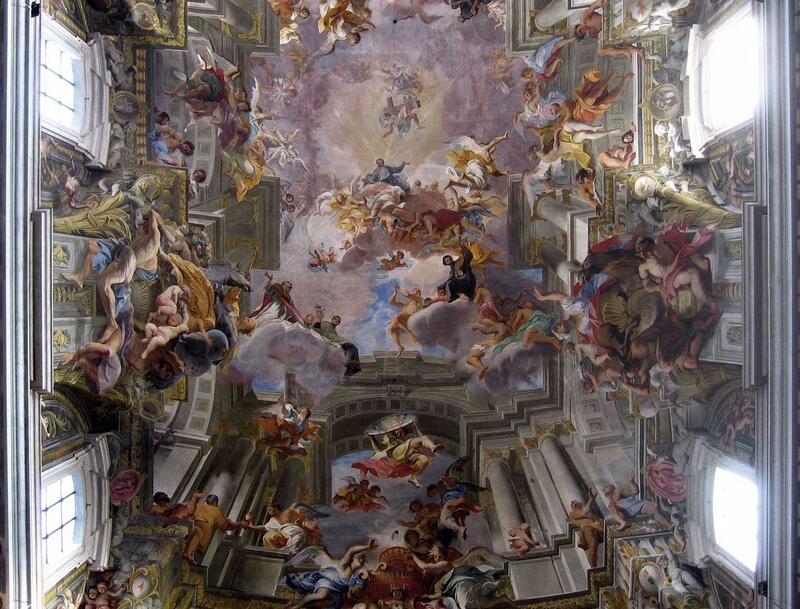 Andrea Pozzo made the fresco trompe l’oeil his speciality, creating extraordinary ceilings such as his Allegory of the Jesuits’ Missionary Work (1691-94) in Sant’Ignazio, Rome. Even in a photograph, it is incredibly hard to know what is 3D reality, and what is just flat painted surface. In Venice, where the damp climate made wall-painting untenable, artists were paid to paint huge canvases in the quest for these grand illusions. Rainer Maria Latzke (born 1950), Untitled fresco (1987), fresco in the library of Chateau Thal, Kettenis, Belgium. Image by Dreamworlds LLC, via Wikimedia Commons. After all these years, interior wall-paintings continue to deceive our perception. 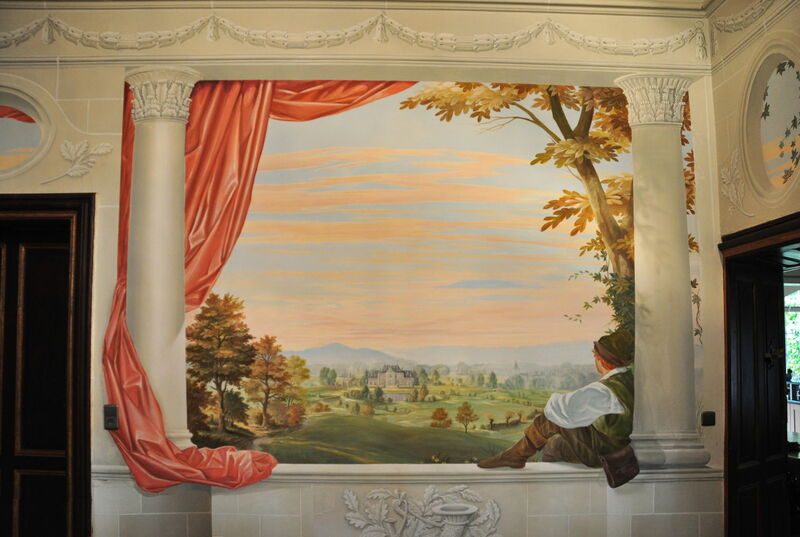 This wonderful fresco, in the library of Chateau Thal, Kettenis, in Belgium, was painted in 1987 by Rainer Maria Latzke, a modern specialist in the genre. Richard John Haas (born 1936), Untitled mural (1989), mural on the Sovereign Hotel, Portland, OR. Image by Steve Morgan, via Wikimedia Commons. With the advent of more durable paints and easier means of access, other artists have transformed the outside surfaces of buildings to similar effect. 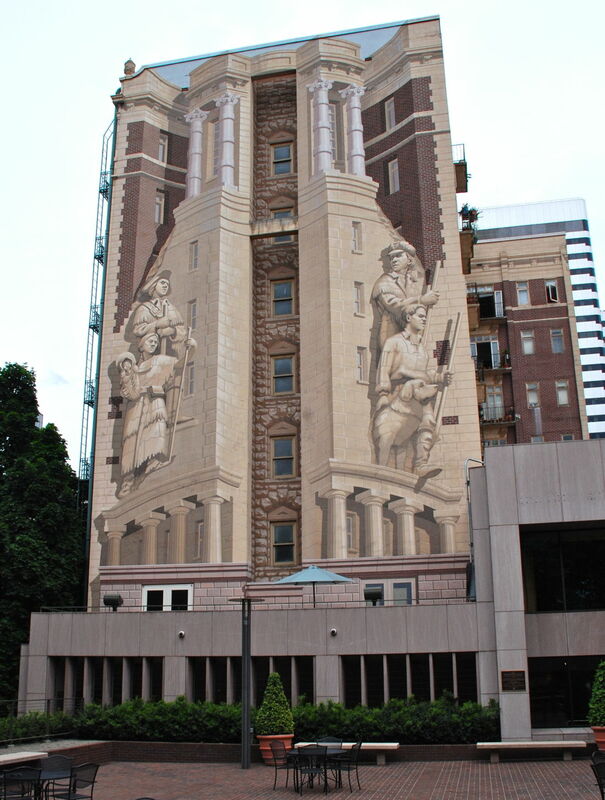 In 1989, Richard John Haas painted two huge murals on the side of the Sovereign Hotel, Portland, OR, to change its appearance. It seems strange, given this long history of vast, vivid, richly-coloured and carefully-projected paintings, that crude monochrome movies should have had any impact when they arrived at the end of the nineteenth century. Yet movies took the world by storm because their images moved – something that no painting could ever do. For nearly fifty years, most movies remained in monochrome. Then, after the Second World War, as movies burst into colour and filled progressively larger screens, homes started to get televisions. Like the first movies before, they initially displayed low-resolution monochrome images, and it wasn’t until the late twentieth century that large-screen high-resolution colour displays became available. Some specialist industries had by then been using multiple electronic displays to create visual environments for training simulators. The first real flight simulators were developed in the early 1950s, and their displays got progressively larger and more visually convincing through the latter half of the twentieth century. So we are told, we are now on the edge of a ‘revolution’ in virtual reality (VR), in which we will don headsets with wide-field binocular displays showing us imaginary worlds. There have also been several pilots of augmented reality (AR), in which spectacles display images which become superimposed on images of the real world beyond. Whether VR and AR will ever become as popular as the industry hopes has yet to be seen. Two things remain clear, though: large wall-paintings which are designed to appear real remain breath-taking perceptual experiences even to viewers hardened by a lifetime of movies, TV, and high-quality colour printing. Finally, we’ll never know how any of these illusions of reality might alter our visual perception, and how much lasting change they might produce. Posted in General, Life, Painting, Technology and tagged 3D, AR, augmented reality, Haas, history of painting, Latzke, Mantegna, Masaccio, Pozzo, TV, virtual reality, vision, VR. Bookmark the permalink.